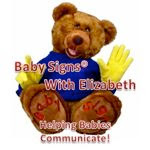 First Impression Favors Free Shipping Sale February 20th Thru February 28th! Free Shipping With Coupon Code FREESHIP! Save Up to $35.95 In Shipping Charges! **offer applies to UPS Ground Shipping or USPS Priority Mail shipping within the US Only. Items that are marked as "heavy and may require extra shipping charges also do not apply"
Save On Your First Order At First Impression Favors! Sign Up For Our Newsletter At www.firstimpressionfavors.com and Save On Your First Purchase With Us! Plannning a celebration this Spring? We have the perfect cake toppers just in at First Impression Favors! Created from Swarovski Crystals upon a stainless steel base, our cake toppers will dance upon the light as they grace the top of your celebration cake. As butterflies represent new beginnings, let your new beginning start with a touch of crystal bling! Select from the contemporary butterfly with it's breathtaking with it's Emerald cut crystal center. Looking for something more traditional? 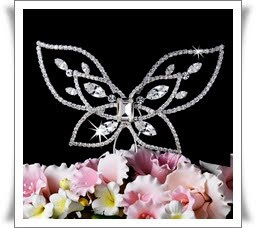 Our traditional butterfly features an intricate pattern of crystals for maximum bling. They also make a perfect gift! After the celebration the prongs can be easily cut. 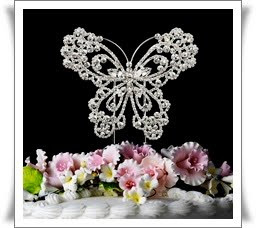 Then simply place the cake topper in a shadow box frame for a keepsake that is also a work of art to be proudly displayed. Matching Swavorski crystal bouquet jewelry is also available. One of our design consultants will be happy to help you coordinate your cake and flower crystal jewelry selections. Its All About the Charm! 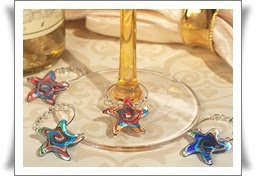 Add a little Charm to your reception tables with our new Murano Glass Wine Charms! Dress up your wine glasses to coordinate with your wedding theme and your guests are sure to be impressed. They also make a most unique yet practical favor for your guests to remember your special day long after the celebration has ended. Inspired by the artisans of Murano Italy, these handcrafted Murano like glass wine charms are nothing short of stunning with their elegance and style. With a touch of art deco inspiration, bold, bright colors and their beaded accents you can be sure you've chosen a winner. Charms arrive packaged in a set of four in a clear top window black gift box. Each charm measures approximately 1" x 1". Five gorgeous Murano Glass styles to choose from - one to compliment any theme! Customer Comments - Leah K.
White rectangle boxes are accented with alternating lavender and green hydrangeas accented with triple white pearl centers.A mix and match of coordinating ribbons create a stunning display.Boxes arrive fully assembled. 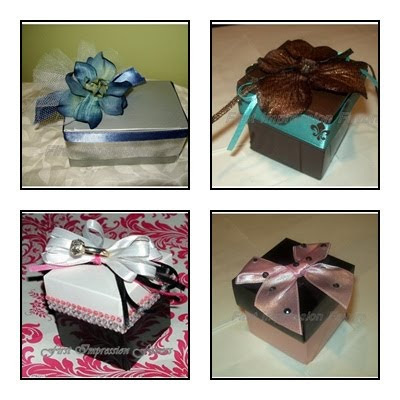 Simply fill with your choice of candies, fudge or even potpourri for a truly custom favor. To view our entire custom line please visit The Exclusively Ours Collection At First Impression Favors. "These are simply beautiful boxes. The lovely green and lavender hydrangeas and gorgeous ribbon make each one a special little work of art. They will make the bridal shower tables look simply beautiful. Thank you so much for your wonderful work. Amy and I will be filling the little boxes with lavender and green jordan almonds this weekend. Best, Leah" - Leah K. - CA. The New Exclusively Ours Collection At First Impression Favors features custom made to order favor boxes, bags and paint cans for every celebration! Our customers and Event Planner's are giving rave reviews! Whether you are planning a baby shower, bridal shower, sweet sixteen, wedding or anniversary party we will custom create a favor just for you. Have a theme or colors in mind? Just let us know and we'll do the work. Simply select your colors and trims and add your own goodies! We suggest hershey kisses, m&m's, jordan almonds, jelly beans, truffles, fudge, cookies, potpourri sachets, bath salt sachets - the possibilities are endless! Tell us your celebration dreams and we'll create a favor as unique as your special day! To view the entire line please visit us at www.firstimpressionfavors.com or email us at sales@firstimpressionfavors.com with your custom request.